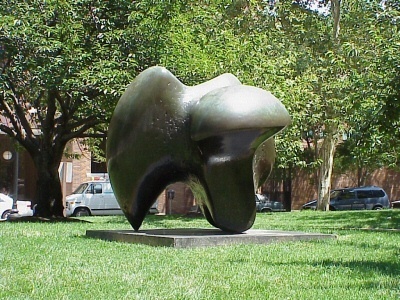 “Sculpture,” said Henry Moore, “should always at first sight have some obscurities, and further meanings.” His one-ton bronze on the Parkway is an example of such visual ambiguities. It may appear to be a massive, polished, three-pointed stone—and in fact Moore kept a similarly shaped pebble in his studio for years. On the other hand, the bronze also looks like a weighty animal, with its three “points” like paws on which it delicately balances. Some have said that it resembles a hunched bird. From certain angles it even suggests a giant tooth or a gnawed bone. Whatever one’s first impression may be, the work changes as the viewer walks around it. Philadelphia’s Three-Way Piece was purchased by the Fairmount Park Art Association in 1967 and installed in John F. Kennedy Plaza that year. In November 1990 the sculpture was relocated to a landscaped area along the Parkway.